Ice Proof for Diesel is developed to improve diesel fuel fluidity at low temperatures. Add to diesel fuel tank. Treat before fuel temperature drops below 5°C (autumn or winter). Dose: one bottle of 125 ml to 50 litres diesel fuel. 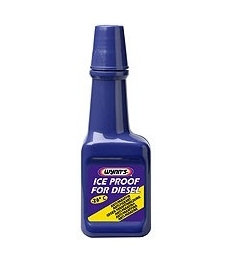 Wynn's Ice Proof for Diesel treats all diesel fuels. Prevents settling of wax crystals in the tank. Slows down the formation of wax crystals.